Tutorials - NOT currently using the template? NOT currently using the template? Getting started with the RIBI webite template, even if your club isn't using it. If a district is using the template for its website, then ALL clubs in the district should have someone registered as a 'club administrator'. The 'club admin' is responsible for keeping club details up to date - such things as the meeting venue and time, club website address. This information is displayed automatically on the template district website without any further action being required. Of course, I want to encourage all clubs to use the template and raise funds for the Rotary Foundation, but recognise that some clubs prefer to do their own thing - there is no compulsion to use the template for your website! After you log in, the following horizontal navigation bar is displayed. Click the 'Club Admin' link. Note the navigation bar only displays 'District Admin' and 'Club Admin' to those post holders - ordinary members do not see them. Only club administrators have access to this area - and they have the facility to designate more than one member as administrator for their club, so the workload can be shared. However, I would recommend no more than 2 or 3 administrators! If this is the first time you visit this page - or your club is NOT using the RIBI template system, the page shown below is displayed. If you DO want to use the template system (and your club is prepared to make a separate payment of at least £50 p.a. 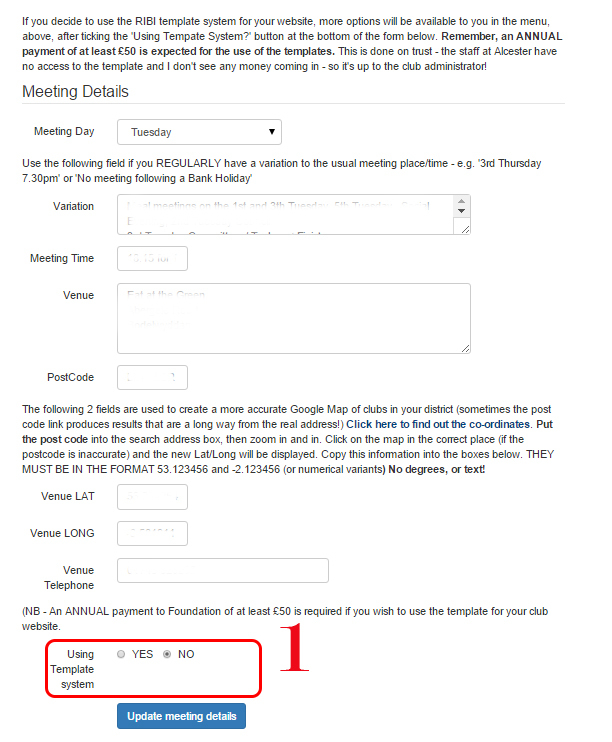 to The Rotary Foundation for its use) tick the button as shown at (1). If you aren't using the template for your website, you can still keep meeting details, external website information etc up to date for display on the district website (if your district is using the template). If you have your own external site, you should NOT tick the 'Using System' button. You will notice that there is a link to a form you can download to make your ANNUAL payment for use of the website facilities. Until you have made your payment to Foundation AND updated the 'renewal due date' in the admin area- i.e. a date one year AFTER you made the payment, your site will not display. Only the club administrator can update the 'renewal due' date - simply sending the cheque to Alcester will not help, as Secretariat staff do not have access to the template. As an extra reminder, when the date is near to your 'renewal due' date, a message similar to that above is displayed. Once the renewal due date is entered and outside the renewal period, no notification message is displayed.